Yesterday. Today. Tomorrow. Oregon Walks is Protecting Your Right to Roam. Walk with us! There are many reasons to love Oregon Walks. Some folks love our nitty-gritty policy work around city planning and pedestrians. So they connect or support our Plans and Projects and advocacy work on the Getting There Together Coalition. Some folks love our commitment to building lasting partnerships that promotes walking (hey AARP Neighborhwalks!) Others love our open streets events, Walkways, that promote place-based community building and a literal taking back of the streets. Then there are people who are deeply concerned about transportation justice and the urgent need to create safer conditions for walking in neighborhoods where a large percentage of pedestrian-only and transit-dependent people live. These supporters love our emerging transportation justice community building in the East Metro area. And many of us love ALL of the ways Oregon Walks works to protect our right to roam. Oregon Walks has been fighting to improve conditions for pedestrians in our state for over two decades; we’ve learned to play the long game and the value of looking at a situation through a multitude of lenses. Our lives, like our roads, are intersectional, and we believe in surfacing multiple perspectives when addressing the question of how we invest public funds for public good. In drafting our statement in opposition of ODOT’s proposed expansion to I-5 in Portland through the Rose Quarter, we have listened to and learned from many: the dedicated members on the Oregon Walks Plans and Projects committee who have been tracking this project since day one, the volunteers of the City of Portland's Pedestrian Advisory Committee who give their time and expertise to ensure safe pedestrian conditions in all city projects, the team at No More Freeways galvanizing active transportation activists organizing a passionate resistance to I-5 freeway expansion, and the leaders of Albina Vision Trust who are offering a beautiful vision and process for what could be done to rebuild what was once a thriving neighborhood and the heart of the black community in Portland. With another transportation trivia in the books, we want to share this great write up of the event by Yashar Vasef of Community Cycling Center, originally posted on BikePortland. We would also like to offer a correction to one of the trivia answers. The question "In The Office, Jim moves from Scranton to a new city and starts bicycle commuting. To which city did he move? " The correct answer is Stamford. We apologize for any confusion and thanks to The Office fans for bringing this to our attention. Getting There Together: Metro Appoints a Transportation Funding Task Force. But is it Enough? Oregon Walks is a proud member of the Getting There Together coalition. One of our colation members, 1000 Friends of Oregon, shared some thoughts on the newly appointed Metro Transportation Funding Task Force. We are seeking Board of Director Members at Large! 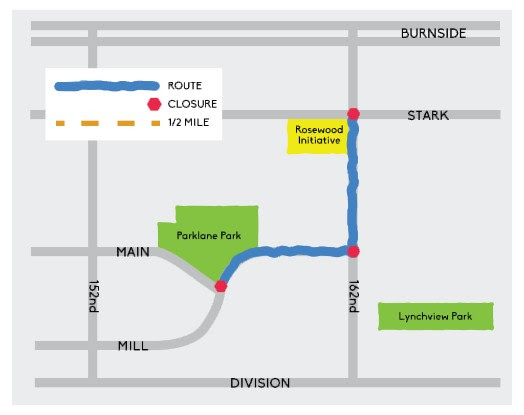 You can be part of work to ensure walking is safe, convenient and attractive throughout the Portland metropolitan region. A Board of Directors is a group of people who volunteer to manage the Executive Director and the financial health of the organization. They also work to promote the mission of the organization and often serve as ambassadors for the mission. You can read more about what a Board of Directors are at the link in our comments. 10 of the 24 people killed using Portland streets so far this year were walking, a percentage that is nearly five times the national average. Five people were killed in traffic-related fatalities in March alone. Late last Wednesday night, on October 10th, 54-year-old Loan T. Diep was killed while crossing outer SE Division near 138th ave when she was hit by two reckless drivers. Only one stayed to face the consequences. While that section of Division was closed for investigation of this horrific act, a third reckless driver swerved around the road closure and into the crime scene, narrowly missing one of the investigators. That this happened on our Portland streets, in a neighborhood dense with homes, businesses, a college campus and numerous social service providers, is unacceptable - though, at this point, hardly surprising. Outer Division has long been Portland’s deadliest corridor for pedestrians, with 19 people killed and 129 seriously injured on Division in the last decade. Loan T. Diep was the fourth pedestrian who lost their life on outer Division this year. Less than three months ago, James F. Deery, 69, was hit 20 blocks away, and later died in hospital from injuries sustained in the crash. Join us for the 2018 Weston Awards! Tickets on sale now! Oregon Walks' annual Weston Awards pay tribute to the feat and feet of walking. 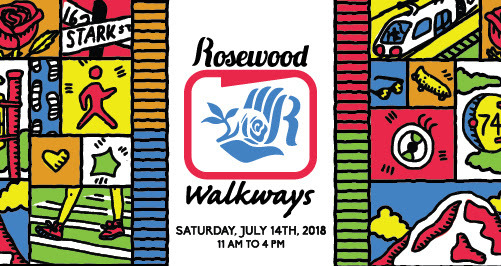 Join us at Rosewood Walkways, Saturday July 14th! How will YOU get involved? - this year in the Rosewood Neighborhood! – and, of course, walking! Join us - RSVP NOW! There are so many ways to be a part of this fantastic event! Read on and decide how you'll be involved!